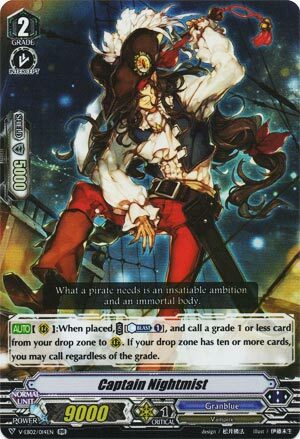 [AUTO](RC):When placed, COST [Counter Blast (1)], and call a grade 1 or less card from your drop zone to (RC). If your drop zone has ten or more cards, you may call regardless of the grade. Basskirk revives Nightmist which revives something else! I swear I see this play all the bloody time when I flight Standard Granblue. And why not? Simple enough skill, being a straight hard +1 and useable on VG and RG circle. Another 4-of-staple that’s simple and therefore not really interesting to talk about.